Many of You are suffered from the low bandwidth of your Internet Connection.Some time we are unable to afford the high bandwidth internet and then the Internet Speed is big headache for us. Question is Did we utilize our complete broadband speed for our Browsing or Downloading?? 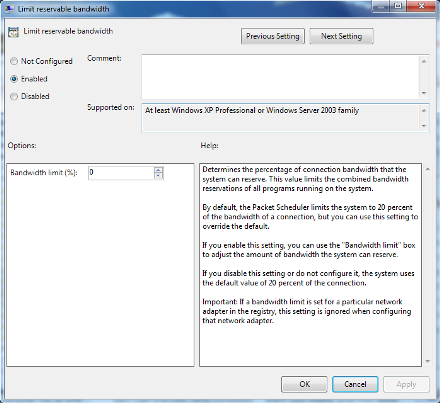 Obviously answer is no that's why I am writing this post for you.In windows Operating System 20 % bandwidth is always reserved for QoS Packet Scheduler.Actually If we have slow connection than we can change that setting so that we can use our 100 % Internet connection speed. Means by changing QoS Packet Scheduler setting we can Increase our Internet bandwidth Speed by 20 %.Its not less amount.So lets Try it. 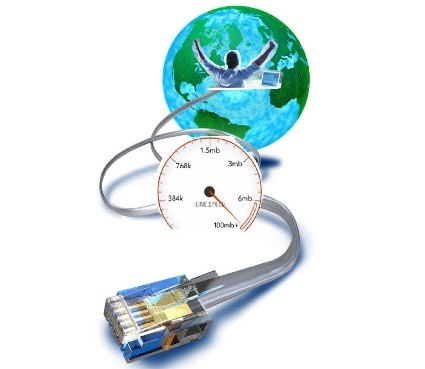 Steps to Increase your Internet Speed or Bandwidth!! 1.Go to run dialogue (Press Window+R) window and type command gpedit.msc. 2.A new window will open.Go to Computer Configuration. 6.Double Click on Limit reservable bandwidth. 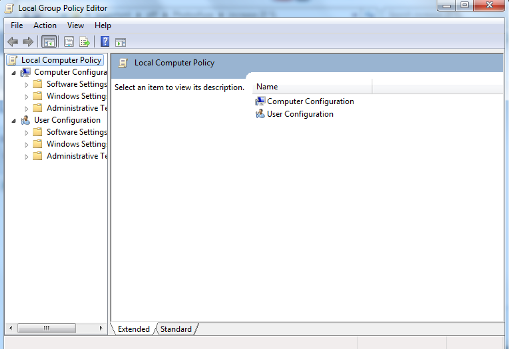 7.Enable it by selecting the enable radio button. 8.Set Bandwidth Limit to 0%. 9.Click Ok and restart your computer. 10.You are done enjoy your 20% higher Internet Speed. Had tried these steps and yeah, it did work! Thanks for this tip. I have tried it successfully with my XP pro PC. However it seems that XP home edition does not have gpedit.msc. wt should i do then...? Change your user-account to administrator or log-on into that. how do i switch to administrator account ? Instead of using Windows+R, go to the start menu -> Type "gpedit.msc" in the bottom bar -> Right click it in the box above -> Select "Run as administrator" -> Enter the admin password -> Follow the rest of the steps. what iso are you using........? 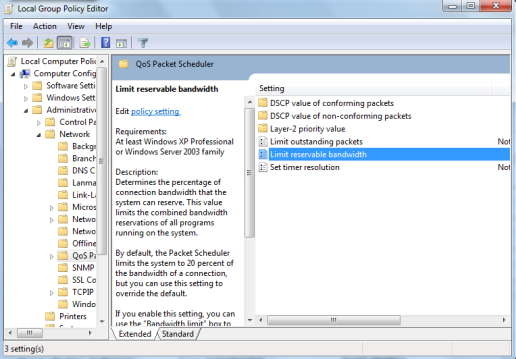 I'm not getting QoS packet sheduler. plz help me! after this seting its decrease downloading speed up to 50% so wht cn i do???? This one doesn't make big difference in the speed, though it was helpful. There are many other ways to improve the speed too. Check them out. does this work in windows 7 ultimate 32 bit ? I'm very pleased to discover this website. I want to to thank you for your time for this fantastic read!! I definitely liked every little bit of it and I have you saved to fav to see new things in your web site. It works way too good ! Does it woork on XP Pro ? Work fine with XP also.. give it try.. Thanks for sharing this nice post. Most of the broadband user facing slow internet problem, but through little efforts they can increase internet speed upto 20%. gpedit.msc is working 100%. so thanks himanshu ji. My question is: How to increase Bandwidth of internet connection so that we can gain more internet downloading speed? Nice post.. Its really useful. Thanks for sharing this. I am on my user account thats an administrater and it still cant find the gpedit.msc thing? What do I do? Great post! Been looking around for tips for bettering my internet. Thanks for the info here! Great post! I've been reading up on this a lot lately. Thanks so much for your work on this blog, and keep it up! Was Facebook down in India?? ?